Yesterday night, we had a really inspiring sharing and dialogue with 9 foreigner visitors including Father Bix. With this chance, they shared their experiences and people here also expressed our thankfulness. We encourage each other in this long struggle and have question to each other. For instance, how to deal with anger, trauma…? 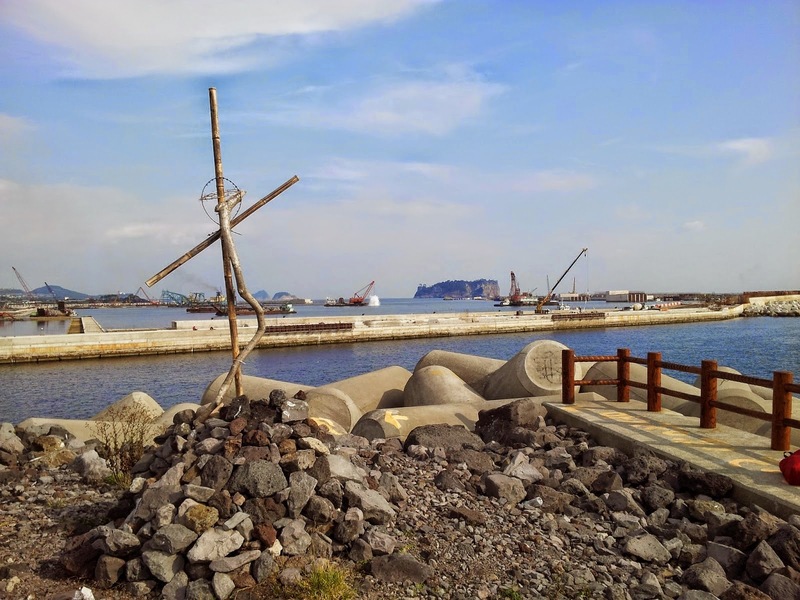 What we gonna do if the [Navy] base construction is finally completed etc…? This is a wonderful community time. In less than 24 hours we will depart Gangjeong village. Jean left this morning. The goodbyes started yesterday. There is tremendous gratitude to us for coming here. In some ways I don’t understand that – hosting and feeding ten people for 10 days is a tremendous task. We have had ‘special meal’ almost everyday – and the regular food at the communal kitchen is delicious – but not too varied. Kimchee varieties, rice and soup- yum. We have been taken to tourist spots including the amazing Buddhist temple grounds and there have been several meetings with key leaders of the movement – each imparting intense information. The community of resistance receives support from visitors – it helps them to have people doing 100 bows and blocking the gate during mass-Eucharistic resistance. 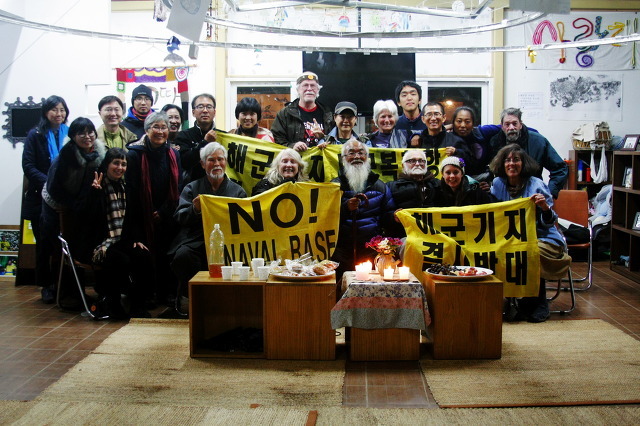 The sister nuns are a steady presence – rotating through here from diocese throughout Korea. Foreign visitors are embraced warmly. The community is tired, but still very together (from an outsider perspective). For me, this time will be impossible to forget – and I am sure I’ll ruminate on it after leaving. How can we to bring this back to our communities – and honor all we have learned? The town is decorated with natural images – of peace. Peace Zone, dream catchers, sea creatures, Gureombi rock. We learned yesterday at the stone museum and grounds “the very deep meaning of stone here’ – much of it volcanic. It is building material, fencing, tools, food prep, sinks, toys and games, water vessel, art, music…. Last night we sat at the peace center with the activists, priests, and a few towns people. Father Bix and I described some of our peace work in the US and then they asked questions to all of us. They had 2-3 sentence bios of each of us that had been translated and printed. At one moment an activist said – everyone sees the damage done to the environment here – but no one can see the deep anger and damage in our hearts. She asked Sonya who works with trauma teams internationally for advice. You could see the reactions – it wasn’t expected – Korean people don’t talk too much about their feelings. The village produces lillies for Japan, a sister told me as we walked to the gate today – but many of the lilly greenhouses were destroyed when they started the base. There is still fishing – but it is diminishing as the sea is being altered with destruction of the fragile soft coral reefs, damage from concrete, blasting, construction toxins/waste and later with ship pollution – oil, fuel, human waste. We were gifted t-shirts today by the international team. 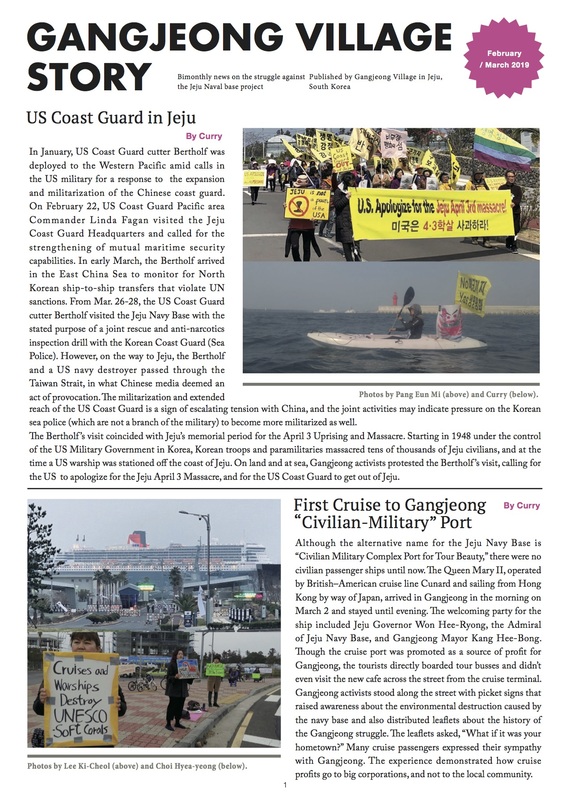 The image is of Jeju island with an open mouthed shark on one end – the shark is in US stars and stripes with the Korean script word ‘Imperialism’.